Maddi and Sofia are best friends. They play in their neighborhood park together. Maddi is really good at climbing the rock wall, while Sofia is a fast runner. 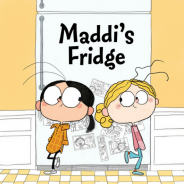 One day Sofia discovers that Maddi has no food in her fridge at home. Sofia wants to help her friend, but Maddi makes her promise not to tell anyone. What should Sofia do? Based on the book by Lois Brandt, this play is a gentle, yet sometimes hilarious exploration of friendship, empathy, and doing the right thing.